Nothing can be more frustrating than roaming the streets late night in search of food to offset your partying. There are many places on earth where this search ends up in some greasy fast food joint with a sleepy chef and sticky tables. The food tastes like last week’s leftovers and your only companions are a pack of mangy mutts eyeing your plate. This does not have to be the end to a great night. Here are 9 cities where finding late night food can be more fun than the partying, as well as some tips on what constitutes a fine wee hours food joint. Infamous Khao san Road in Bangkok’s tourist district is a veritable smörgåsbord. 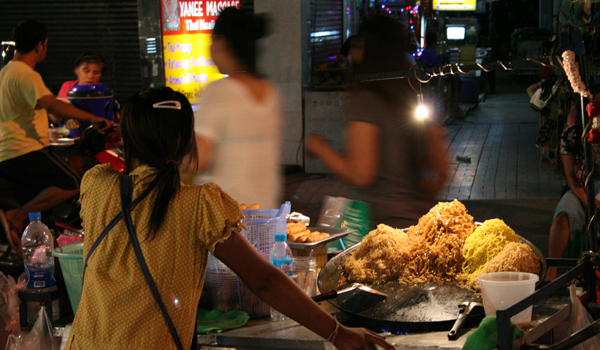 After the restaurants close at around 2 AM, the stalls take over and serve fried and roast chicken with sticky rice, fried noodles with veggies and pork, sweet pancakes and spicy omelettes, plus a wide variety of crunchy, deep fried critters. But Khaosan is just a microcosm of Bangkok’s universe of excellent street food. There are night markets throughout the city–near the train station, around temples, and clinging to the famous river market on the other side of town. The good thing about Bangkok is that tuk-tuks can take you anywhere. The best strategy is to let yourself get taken on some tour during the day and keep feeding your tuk-tuk driver smokes. At night, find this guy again and let him know you need the special meal that only he knows about. He’ll take you to his buddy’s place and make sure you eat well. Now obviously, tuk-tuks rip people off now and then, but the rumors are worse than reality. Most problems arise when trashed Westerners try and skip out of a tuk-tuk and not pay the fare. Canton is cheaper than Hong Kong, but Canton has the raucous after-market, after-club crowds and the chaotic feel of Mainland China. Depends on what you like: In Hong Kong, Two streets down from Nathan Road in any direction will likely lead to a late night dive or a night market. Follow the clothes racks and CD boxes down until you start smelling hot oil. The same recipe works for Canton: these are cities that thrive off the export business. Pick a product, find its corresponding black market, and wander there during the night to find out where the locals get their midnight snacks. Docks and ferries are always a good spot to check out. Again, it is best to do your research before you get drunk and lust after beef noodles. Walk around during the day and check out your neighborhood. Visit the fish market and snap some pictures. When the time comes and your vision is too blurry to see the landmarks you noticed during the day, leave trust to autopilot and the gods who watch over wayward travelers. 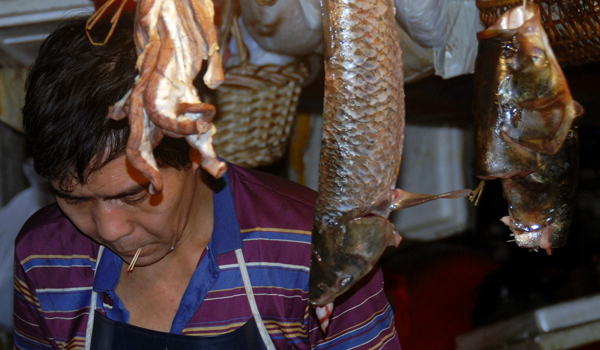 Asian cities have a different view of time and food than most American cities. In the US, you might be able to find a late night diner or even a hot dog and burrito stand, but there will not be a whole block of them filled with wandering drunkards and couples, gathering around stalls serving up full meals amid an orchestra of hissing woks and screaming cooks. In Madrid, dinner often starts at 10 PM, and espresso after dinner ensures that people will be up and about all night. Breakfast joints serve fried snacks just before dawn and offer some more espresso for those who have to go to work, and warm milk with honey for the lucky few who can sleep in. Hamburg has the Reeperbahn, which employs several waves of revelry — starting at 10 PM, 1 AM, and again around 4 AM– and dumps music, sausages and a lot of beer onto the streets for locals and tourists to gobble up and enjoy. The late night food here ranges from huge doener kebabs to Thai noodles, pizza and calzones, and, of course, fine German fare of broetchen and sausages. It is drinking food and demands a beer as accompaniment. But it’s not just Hamburg: in other German cities like Frankfurt, Cologne, Berlin, and Munich, the bars do not close until the clientèle has left. What’s more, the police will not swoop down on a public gathering on the Rhine, Main or Potsdamer Platz. Paris is a city that does not sleep and therefore naturally provides the fare for such a lifestyle. 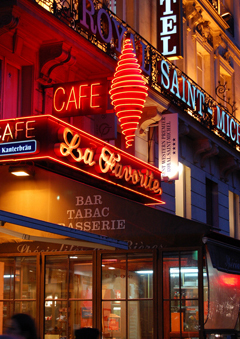 Brassieres and cafes are open late into the night and many of them 24 hours to accommodate lovers who slide into booths at all hours of the night, searching for dessert and hot chocolate. Crepes, the quintessential French snack, do not care what time they are served up. Around the many monuments, along the Seine and down any alleyway or small side street, there will be a nook with a light on waiting for you to sit and shake off the 3 AM doldrums with a shot of brandy and a buttered up croissant. It’s the way all cities should be. Some people may overlook Istanbul, but it is without question one of the most beautiful and vibrant cities in the world. Kebabs in Germany pale in comparison to kebabs in Turkey. Coffee in Madrid is shamed by the sweet blackness served up in small cafes in Istanbul, and breakfast takes on new meaning after swallowing soft, hot pastries served before sunrise in plazas overlooking the Bosporus. “Late night food” is a weak phrase for the life to be had in Istanbul after the sun goes down. Go to a club on the European side then munch candied peanuts on a ferry across to the Asian side and get ready for a crowd of Turks to grab you up and take you to where “the real food” is. Nothing says “after party” like Mexican food. There is no need to search for the late night spot in Mexico; they pop up on every street, wait for you at the end of alleys and light up plazas with white Christmas lights. Follow the music. There are towns other than Mexico City where the late night food is easier to find and less dangerous to consume, like any place in Oaxaca, Cancun, and Acapulco. 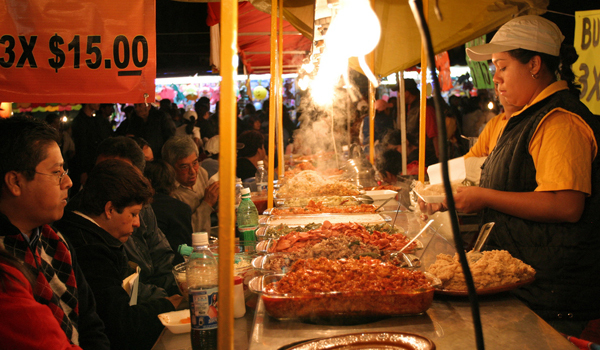 Mexico City also holds the secret of Chino-Latino cuisine: a mixture of Chinese street food and Mexican ingredients and methods that are irresistible to the starving night-owl traveler. And last but not least, I have to leave you with New York City. The Apple is one of the two or three cities in the USA that has its very own excellent, late night food 24/7 at good prices. You can’t beat spots like Tom’s, The Carnegie and the Empire Diner. These are the famous diners that serve that greasy luvin’ that Americans like to stuff their bellies with after a night on the town. There are also mobile hot dog dispensing units and grilled cheese hideouts at the edge of Manhattan and all around Brooklyn. On both sides of the Brooklyn Bridge are fine Chinese joints and there are even a few high-class options like the Mai House. Enjoy. Looking for a good party to stoke those late night cravings? How about the Best Nightlife in Bangkok? Or maybe head to one of the world’s 10 best rooftop bars, check out the top dive bars in Vegas, or hit up one of the top 10 nightlife spots in Mexico City.